FROM THE MOMENT the first airplane crashed into the World Trade Center on the morning of September 11, 2001, the world has asked one simple and compelling question: How could it happen? Three and a half years later, not everyone is convinced we know the truth. Go to Google.com, type in the search phrase "World Trade Center conspiracy" and you'll get links to an estimated 628,000 Web sites. More than 3000 books on 9/11 have been published; many of them reject the official consensus that hijackers associated with Osama bin Laden and Al Qaeda flew passenger planes into U.S. landmarks. Healthy skepticism, it seems, has curdled into paranoia. Wild conspiracy tales are peddled daily on the Internet, talk radio and in other media. Blurry photos, quotes taken out of context and sketchy eyewitness accounts have inspired a slew of elaborate theories: The Pentagon was struck by a missile; the World Trade Center was razed by demolition-style bombs; Flight 93 was shot down by a mysterious white jet. As outlandish as these claims may sound, they are increasingly accepted abroad and among extremists here in the United States. To investigate 16 of the most prevalent claims made by conspiracy theorists, POPULAR MECHANICS assembled a team of nine researchers and reporters who, together with PM editors, consulted more than 70 professionals in fields that form the core content of this magazine, including aviation, engineering and the military. The widely accepted account that hijackers commandeered and crashed the four 9/11 planes is supported by reams of evidence, from cockpit recordings to forensics to the fact that crews and passengers never returned home. Nonetheless, conspiracy theorists seize on a handful of "facts" to argue a very different scenario: The jets that struck New York and Washington, D.C., weren't commercial planes, they say, but something else, perhaps refueling tankers or guided missiles. And the lack of military intervention? Theorists claim it proves the U.S. government instigated the assault or allowed it to occur in order to advance oil interests or a war agenda. CLAIM: Photographs and video footage shot just before United Airlines Flight 175 hit the South Tower of the World Trade Center (WTC) show an object underneath the fuselage at the base of the right wing. The film "911 In Plane Site" and the Web site LetsRoll911.org claim that no such object is found on a stock Boeing 767. They speculate that this "military pod" is a missile, a bomb or a piece of equipment on an air-refueling tanker. LetsRoll911.org points to this as evidence that the attacks were an "inside job" sanctioned by "President George Bush, who planned and engineered 9/11." FACT: One of the clearest, most widely seen pictures of the doomed jet's undercarriage was taken by photographer Rob Howard and published in New York magazine and elsewhere (opening page). PM sent a digital scan of the original photo to Ronald Greeley, director of the Space Photography Laboratory at Arizona State University. Greeley is an expert at analyzing images to determine the shape and features of geological formations based on shadow and light effects. After studying the high-resolution image and comparing it to photos of a Boeing 767-200ER's undercarriage, Greeley dismissed the notion that the Howard photo reveals a "pod." In fact, the photo reveals only the Boeing's right fairing, a pronounced bulge that contains the landing gear. He concludes that sunlight glinting off the fairing gave it an exaggerated look. "Such a glint causes a blossoming (enlargement) on film," he writes in an e-mail to PM, "which tends to be amplified in digital versions of images--the pixels are saturated and tend to 'spill over' to adjacent pixels." When asked about pods attached to civilian aircraft, Fred E. Culick, professor of aeronautics at the California Institute of Technology, gave a blunter response: "That's bull. They're really stretching." CLAIM: No fighter jets were scrambled from any of the 28 Air Force bases within close range of the four hijacked flights. "On 11 September Andrews had two squadrons of fighter jets with the job of protecting the skies over Washington D.C.," says the Web site emperors-clothes.com. "They failed to do their job." "There is only one explanation for this," writes Mark R. Elsis of StandDown.net. "Our Air Force was ordered to Stand Down on 9/11." FACT: On 9/11 there were only 14 fighter jets on alert in the contiguous 48 states. No computer network or alarm automatically alerted the North American Air Defense Command (NORAD) of missing planes. "They [civilian Air Traffic Control, or ATC] had to pick up the phone and literally dial us," says Maj. Douglas Martin, public affairs officer for NORAD. Boston Center, one of 22 Federal Aviation Administration (FAA) regional ATC facilities, called NORAD's Northeast Air Defense Sector (NEADS) three times: at 8:37 am EST to inform NEADS that Flight 11 was hijacked; at 9:21 am to inform the agency, mistakenly, that Flight 11 was headed for Washington (the plane had hit the North Tower 35 minutes earlier); and at 9:41 am to (erroneously) identify Delta Air Lines Flight 1989 from Boston as a possible hijacking. The New York ATC called NEADS at 9:03 am to report that United Flight 175 had been hijacked--the same time the plane slammed into the South Tower. Within minutes of that first call from Boston Center, NEADS scrambled two F-15s from Otis Air Force Base in Falmouth, Mass., and three F-16s from Langley Air National Guard Base in Hampton, Va. None of the fighters got anywhere near the pirated planes. Why couldn't ATC find the hijacked flights? When the hijackers turned off the planes' transponders, which broadcast identifying signals, ATC had to search 4500 identical radar blips crisscrossing some of the country's busiest air corridors. And NORAD's sophisticated radar? It ringed the continent, looking outward for threats, not inward. "It was like a doughnut," Martin says. "There was no coverage in the middle." Pre-9/11, flights originating in the States were not seen as threats and NORAD wasn't prepared to track them. Coupled with photographs and videos of Flight 175 that lack the resolution to show windows, Birnbach's statement has fueled one of the most widely referenced 9/11 conspiracy theories--specifically, that the South Tower was struck by a military cargo plane or a fuel tanker. While heading a Federal Emergency Management Agency (FEMA) probe into the collapse of the towers, W. Gene Corley studied the airplane wreckage. A licensed structural engineer with Construction Technology Laboratories, a consulting firm based in Skokie, Ill., Corley and his team photographed aircraft debris on the roof of WTC 5, including a chunk of fuselage that clearly had passenger windows. "It's ... from the United Airlines plane that hit Tower 2," Corley states flatly. In reviewing crash footage taken by an ABC news crew, Corley was able to track the trajectory of the fragments he studied--including a section of the landing gear and part of an engine--as they tore through the South Tower, exited from the building's north side and fell from the sky. CLAIM: "It has been standard operating procedures for decades to immediately intercept off-course planes that do not respond to communications from air traffic controllers," says the Web site oilempire.us. "When the Air Force 'scrambles' a fighter plane to intercept, they usually reach the plane in question in minutes." FACT: In the decade before 9/11, NORAD intercepted only one civilian plane over North America: golfer Payne Stewart's Learjet, in October 1999. With passengers and crew unconscious from cabin decompression, the plane lost radio contact but remained in transponder contact until it crashed. Even so, it took an F-16 1 hour and 22 minutes to reach the stricken jet. Rules in effect back then, and on 9/11, prohibited supersonic flight on intercepts. Prior to 9/11, all other NORAD interceptions were limited to offshore Air Defense Identification Zones (ADIZ). "Until 9/11 there was no domestic ADIZ," FAA spokesman Bill Schumann tells PM. After 9/11, NORAD and the FAA increased cooperation, setting up hotlines between ATCs and NORAD command centers, according to officials from both agencies. NORAD has also increased its fighter coverage and has installed radar to monitor airspace over the continent. The collapse of both World Trade Center towers--and the smaller WTC 7 a few hours later--initially surprised even some experts. But subsequent studies have shown that the WTC's structural integrity was destroyed by intense fire as well as the severe damage inflicted by the planes. That explanation hasn't swayed conspiracy theorists, who contend that all three buildings were wired with explosives in advance and razed in a series of controlled demolitions. CLAIM: The first hijacked plane crashed through the 94th to the 98th floors of the World Trade Center's 110-story North Tower; the second jet slammed into the 78th to the 84th floors of the 110-story South Tower. The impact and ensuing fires disrupted elevator service in both buildings. Plus, the lobbies of both buildings were visibly damaged before the towers collapsed. "There is NO WAY the impact of the jet caused such widespread damage 80 stories below," claims a posting on the San Diego Independent Media Center Web site (sandiego.indymedia.org). "It is OBVIOUS and irrefutable that OTHER EXPLOSIVES (... such as concussion bombs) HAD ALREADY BEEN DETONATED in the lower levels of tower one at the same time as the plane crash." FACT: Following up on a May 2002 preliminary report by the Federal Emergency Management Agency (FEMA), a major study will be released in spring 2005 by the National Institute of Standards and Technology (NIST), a branch of the U.S. Department of Commerce. NIST shared its initial findings with PM and made its lead researcher available to our team of reporters. The NIST investigation revealed that plane debris sliced through the utility shafts at the North Tower's core, creating a conduit for burning jet fuel--and fiery destruction throughout the building. "It's very hard to document where the fuel went," says Forman Williams, a NIST adviser and a combustion expert, "but if it's atomized and combustible and gets to an ignition source, it'll go off." Burning fuel traveling down the elevator shafts would have disrupted the elevator systems and caused extensive damage to the lobbies. NIST heard first-person testimony that "some elevators slammed right down" to the ground floor. "The doors cracked open on the lobby floor and flames came out and people died," says James Quintiere, an engineering professor at the University of Maryland and a NIST adviser. A similar observation was made in the French documentary "9/11," by Jules and Gedeon Naudet. As Jules Naudet entered the North Tower lobby, minutes after the first aircraft struck, he saw victims on fire, a scene he found too horrific to film. CLAIM: "We have been lied to," announces the Web site AttackOnAmerica.net. "The first lie was that the load of fuel from the aircraft was the cause of structural failure. No kerosene fire can burn hot enough to melt steel." The posting is entitled "Proof Of Controlled Demolition At The WTC." FACT: Jet fuel burns at 800° to 1500°F, not hot enough to melt steel (2750°F). However, experts agree that for the towers to collapse, their steel frames didn't need to melt, they just had to lose some of their structural strength--and that required exposure to much less heat. "I have never seen melted steel in a building fire," says retired New York deputy fire chief Vincent Dunn, author of The Collapse Of Burning Buildings: A Guide To Fireground Safety. "But I've seen a lot of twisted, warped, bent and sagging steel. What happens is that the steel tries to expand at both ends, but when it can no longer expand, it sags and the surrounding concrete cracks." "Steel loses about 50 percent of its strength at 1100°F," notes senior engineer Farid Alfawak-hiri of the American Institute of Steel Construction. "And at 1800° it is probably at less than 10 percent." NIST also believes that a great deal of the spray-on fireproofing insulation was likely knocked off the steel beams that were in the path of the crashing jets, leaving the metal more vulnerable to the heat. But jet fuel wasn't the only thing burning, notes Forman Williams, a professor of engineering at the University of California, San Diego, and one of seven structural engineers and fire experts that PM consulted. He says that while the jet fuel was the catalyst for the WTC fires, the resulting inferno was intensified by the combustible material inside the buildings, including rugs, curtains, furniture and paper. NIST reports that pockets of fire hit 1832°F. "The jet fuel was the ignition source," Williams tells PM. "It burned for maybe 10 minutes, and [the towers] were still standing in 10 minutes. It was the rest of the stuff burning afterward that was responsible for the heat transfer that eventually brought them down." CLAIM: As each tower collapsed, clearly visible puffs of dust and debris were ejected from the sides of the buildings. An advertisement in The New York Times for the book Painful Questions: An Analysis Of The September 11th Attack made this claim: "The concrete clouds shooting out of the buildings are not possible from a mere collapse. They do occur from explosions." Numerous conspiracy theorists cite Van Romero, an explosives expert and vice president of the New Mexico Institute of Mining and Technology, who was quoted on 9/11 by the Albuquerque Journal as saying "there were some explosive devices inside the buildings that caused the towers to collapse." The article continues, "Romero said the collapse of the structures resembled those of controlled implosions used to demolish old structures." FACT: Once each tower began to collapse, the weight of all the floors above the collapsed zone bore down with pulverizing force on the highest intact floor. Unable to absorb the massive energy, that floor would fail, transmitting the forces to the floor below, allowing the collapse to progress downward through the building in a chain reaction. Engineers call the process "pancaking," and it does not require an explosion to begin, according to David Biggs, a structural engineer at Ryan-Biggs Associates and a member of the American Society of Civil Engineers (ASCE) team that worked on the FEMA report. Like all office buildings, the WTC towers contained a huge volume of air. As they pancaked, all that air--along with the concrete and other debris pulverized by the force of the collapse--was ejected with enormous energy. "When you have a significant portion of a floor collapsing, it's going to shoot air and concrete dust out the window," NIST lead investigator Shyam Sunder tells PM. Those clouds of dust may create the impression of a controlled demolition, Sunder adds, "but it is the floor pancaking that leads to that perception." Demolition expert Romero regrets that his comments to the Albuquerque Journal became fodder for conspiracy theorists. "I was misquoted in saying that I thought it was explosives that brought down the building," he tells PM. "I only said that that's what it looked like." Romero, who agrees with the scientific conclusion that fire triggered the collapses, demanded a retraction from the Journal. It was printed Sept. 22, 2001. "I felt like my scientific reputation was on the line." But emperors-clothes.com saw something else: "The paymaster of Romero's research institute is the Pentagon. Directly or indirectly, pressure was brought to bear, forcing Romero to retract his original statement." Romero responds: "Conspiracy theorists came out saying that the government got to me. That is the farthest thing from the truth. This has been an albatross around my neck for three years." CLAIM: Seismographs at Columbia University's Lamont-Doherty Earth Observatory in Palisades, N.Y., 21 miles north of the WTC, recorded the events of 9/11. "The strongest jolts were all registered at the beginning of the collapses, well before falling debris struck the earth," reports the Web site WhatReallyHappened.com. A columnist on Prisonplanet.com, a Web site run by radio talk show host Alex Jones, claims the seismic spikes (boxed area on Graph 1) are "indisputable proof that massive explosions brought down" the towers. The Web site says its findings are supported by two seismologists at the observatory, Won-Young Kim and Arthur Lerner-Lam. Each "sharp spike of short duration," says Prisonplanet.com, was consistent with a "demolition-style implosion." FACT: "There is no scientific basis for the conclusion that explosions brought down the towers," Lerner-Lam tells PM. "That representation of our work is categorically incorrect and not in context." The report issued by Lamont-Doherty includes various graphs showing the seismic readings produced by the planes crashing into the two towers as well as the later collapse of both buildings. WhatReallyHappened.com chooses to display only one graph (Graph 1), which shows the readings over a 30-minute time span. On that graph, the 8- and 10-second collapses appear--misleadingly--as a pair of sudden spikes. Lamont-Doherty's 40-second plot of the same data (Graph 2) gives a much more detailed picture: The seismic waves--blue for the South Tower, red for the North Tower--start small and then escalate as the buildings rumble to the ground. Translation: no bombs. CLAIM: Seven hours after the two towers fell, the 47-story WTC 7 collapsed. According to 911review.org: "The video clearly shows that it was not a collapse subsequent to a fire, but rather a controlled demolition: amongst the Internet investigators, the jury is in on this one." FACT: Many conspiracy theorists point to FEMA's preliminary report, which said there was relatively light damage to WTC 7 prior to its collapse. With the benefit of more time and resources, NIST researchers now support the working hypothesis that WTC 7 was far more compromised by falling debris than the FEMA report indicated. "The most important thing we found was that there was, in fact, physical damage to the south face of building 7," NIST's Sunder tells PM. "On about a third of the face to the center and to the bottom--approximately 10 stories--about 25 percent of the depth of the building was scooped out." NIST also discovered previously undocumented damage to WTC 7's upper stories and its southwest corner. NIST investigators believe a combination of intense fire and severe structural damage contributed to the collapse, though assigning the exact proportion requires more research. But NIST's analysis suggests the fall of WTC 7 was an example of "progressive collapse," a process in which the failure of parts of a structure ultimately creates strains that cause the entire building to come down. Videos of the fall of WTC 7 show cracks, or "kinks," in the building's facade just before the two penthouses disappeared into the structure, one after the other. The entire building fell in on itself, with the slumping east side of the structure pulling down the west side in a diagonal collapse. According to NIST, there was one primary reason for the building's failure: In an unusual design, the columns near the visible kinks were carrying exceptionally large loads, roughly 2000 sq. ft. of floor area for each floor. "What our preliminary analysis has shown is that if you take out just one column on one of the lower floors," Sunder notes, "it could cause a vertical progression of collapse so that the entire section comes down." There are two other possible contributing factors still under investigation: First, trusses on the fifth and seventh floors were designed to transfer loads from one set of columns to another. With columns on the south face apparently damaged, high stresses would likely have been communicated to columns on the building's other faces, thereby exceeding their load-bearing capacities. Second, a fifth-floor fire burned for up to 7 hours. "There was no firefighting in WTC 7," Sunder says. Investigators believe the fire was fed by tanks of diesel fuel that many tenants used to run emergency generators. Most tanks throughout the building were fairly small, but a generator on the fifth floor was connected to a large tank in the basement via a pressurized line. Says Sunder: "Our current working hypothesis is that this pressurized line was supplying fuel [to the fire] for a long period of time." WTC 7 might have withstood the physical damage it received, or the fire that burned for hours, but those combined factors--along with the building's unusual construction--were enough to set off the chain-reaction collapse. At 9:37 am on 9/11, 51 minutes after the first plane hit the World Trade Center, the Pentagon was similarly attacked. Though dozens of witnesses saw a Boeing 757 hit the building, conspiracy advocates insist there is evidence that a missile or a different type of plane smashed into the Pentagon. CLAIM: Two holes were visible in the Pentagon immediately after the attack: a 75-ft.-wide entry hole in the building's exterior wall, and a 16-ft.-wide hole in Ring C, the Pentagon's middle ring. Conspiracy theorists claim both holes are far too small to have been made by a Boeing 757. "How does a plane 125 ft. wide and 155 ft. long fit into a hole which is only 16 ft. across?" asks reopen911.org, a Web site "dedicated to discovering the bottom line truth to what really occurred on September 11, 2001." The truth is of even less importance to French author Thierry Meyssan, whose baseless assertions are fodder for even mainstream European and Middle Eastern media. In his book The Big Lie, Meyssan concludes that the Pentagon was struck by a satellite-guided missile--part of an elaborate U.S. military coup. "This attack," he writes, "could only be committed by United States military personnel against other U.S. military personnel." FACT: When American Airlines Flight 77 hit the Pentagon's exterior wall, Ring E, it created a hole approximately 75 ft. wide, according to the ASCE Pentagon Building Performance Report. The exterior facade collapsed about 20 minutes after impact, but ASCE based its measurements of the original hole on the number of first-floor support columns that were destroyed or damaged. Computer simulations confirmed the findings. The tidy hole in Ring C was 12 ft. wide--not 16 ft. ASCE concludes it was made by the jet's landing gear, not by the fuselage. CLAIM: Many Pentagon windows remained in one piece--even those just above the point of impact from the Boeing 757 passenger plane. Pentagonstrike.co.uk, an online animation widely circulated in the United States and Europe, claims that photographs showing "intact windows" directly above the crash site prove "a missile" or "a craft much smaller than a 757" struck the Pentagon. FACT: Some windows near the impact area did indeed survive the crash. But that's what the windows were supposed to do--they're blast-resistant. "A blast-resistant window must be designed to resist a force significantly higher than a hurricane that's hitting instantaneously," says Ken Hays, executive vice president of Masonry Arts, the Bessemer, Ala., company that designed, manufactured and installed the Pentagon windows. Some were knocked out of the walls by the crash and the outer ring's later collapse. "They were not designed to receive wracking seismic force," Hays notes. "They were designed to take in inward pressure from a blast event, which apparently they did: [Before the collapse] the blinds were still stacked neatly behind the window glass." CLAIM: Conspiracy theorists insist there was no plane wreckage at the Pentagon. "In reality, a Boeing 757 was never found," claims pentagonstrike.co.uk, which asks the question, "What hit the Pentagon on 9/11?" Cockpit recordings indicate the passengers on United Airlines Flight 93 teamed up to attack their hijackers, forcing down the plane near Shanksville, in southwestern Pennsylvania. But conspiracy theorists assert Flight 93 was destroyed by a heat-seeking missile from an F-16 or a mysterious white plane. Some theorists add far-fetched elaborations: No terrorists were aboard, or the passengers were drugged. The wildest is the "bumble planes" theory, which holds that passengers from Flights 11, 175 and 77 were loaded onto Flight 93 so the U.S. government could kill them. CLAIM: At least six eyewitnesses say they saw a small white jet flying low over the crash area almost immediately after Flight 93 went down. BlogD.com theorizes that the aircraft was downed by "either a missile fired from an Air Force jet, or via an electronic assault made by a U.S. Customs airplane reported to have been seen near the site minutes after Flight 93 crashed." WorldNetDaily.com weighs in: "Witnesses to this low-flying jet ... told their story to journalists. Shortly thereafter, the FBI began to attack the witnesses with perhaps the most inane disinformation ever--alleging the witnesses actually observed a private jet at 34,000 ft. The FBI says the jet was asked to come down to 5000 ft. and try to find the crash site. This would require about 20 minutes to descend." FACT: There was such a jet in the vicinity--a Dassault Falcon 20 business jet owned by the VF Corp. of Greensboro, N.C., an apparel company that markets Wrangler jeans and other brands. The VF plane was flying into Johnstown-Cambria airport, 20 miles north of Shanksville. According to David Newell, VF's director of aviation and travel, the FAA's Cleveland Center contacted copilot Yates Gladwell when the Falcon was at an altitude "in the neighborhood of 3000 to 4000 ft."--not 34,000 ft. "They were in a descent already going into Johnstown," Newell adds. "The FAA asked them to investigate and they did. They got down within 1500 ft. of the ground when they circled. They saw a hole in the ground with smoke coming out of it. They pinpointed the location and then continued on." Reached by PM, Gladwell confirmed this account but, concerned about ongoing harassment by conspiracy theorists, asked not to be quoted directly. CLAIM: One of Flight 93's engines was found "at a considerable distance from the crash site," according to Lyle Szupinka, a state police officer on the scene who was quoted in the Pittsburgh Tribune-Review. Offering no evidence, a posting on Rense.com claimed: "The main body of the engine ... was found miles away from the main wreckage site with damage comparable to that which a heat-seeking missile would do to an airliner." FACT: Experts on the scene tell PM that a fan from one of the engines was recovered in a catchment basin, downhill from the crash site. Jeff Reinbold, the National Park Service representative responsible for the Flight 93 National Memorial, confirms the direction and distance from the crash site to the basin: just over 300 yards south, which means the fan landed in the direction the jet was traveling. "It's not unusual for an engine to move or tumble across the ground," says Michael K. Hynes, an airline accident expert who investigated the crash of TWA Flight 800 out of New York City in 1996. "When you have very high velocities, 500 mph or more," Hynes says, "you are talking about 700 to 800 ft. per second. For something to hit the ground with that kind of energy, it would only take a few seconds to bounce up and travel 300 yards." Numerous crash analysts contacted by PM concur. CLAIM: "Residents and workers at businesses outside Shanksville, Somerset County, reported discovering clothing, books, papers and what appeared to be human remains," states a Pittsburgh Post-Gazette article dated Sept. 13, 2001. "Others reported what appeared to be crash debris floating in Indian Lake, nearly 6 miles from the immediate crash scene." Commenting on reports that Indian Lake residents collected debris, Think AndAsk.com speculates: "On Sept. 10, 2001, a strong cold front pushed through the area, and behind it--winds blew northerly. Since Flight 93 crashed west-southwest of Indian Lake, it was impossible for debris to fly perpendicular to wind direction. ... The FBI lied." And the significance of widespread debris? Theorists claim the plane was breaking up before it crashed. TheForbiddenKnowledge.com states bluntly: "Without a doubt, Flight 93 was shot down." FACT: Wallace Miller, Somerset County coroner, tells PM no body parts were found in Indian Lake. Human remains were confined to a 70-acre area directly surrounding the crash site. Paper and tiny scraps of sheetmetal, however, did land in the lake. "Very light debris will fly into the air, because of the concussion," says former National Transportation Safety Board investigator Matthew McCormick. Indian Lake is less than 1.5 miles southeast of the impact crater--not 6 miles--easily within range of debris blasted skyward by the heat of the explosion from the crash. And the wind that day was northwesterly, at 9 to 12 mph, which means it was blowing from the northwest--toward Indian Lake. CLAIM: In February 2004, retired Army Col. Donn de Grand-Pre said on "The Alex Jones Show," a radio talk show broadcast on 42 stations: "It [Flight 93] was taken out by the North Dakota Air Guard. I know the pilot who fired those two missiles to take down 93." LetsRoll911.org, citing de Grand-Pre, identifies the pilot: "Major Rick Gibney fired two Sidewinder missiles at the aircraft and destroyed it in midflight at precisely 0958." FACT: Saying he was reluctant to fuel debate by responding to unsubstantiated charges, Gibney (a lieutenant colonel, not a major) declined to comment. According to Air National Guard spokesman Master Sgt. David Somdahl, Gibney flew an F-16 that morning--but nowhere near Shanksville. He took off from Fargo, N.D., and flew to Bozeman, Mont., to pick up Ed Jacoby Jr., the director of the New York State Emergency Management Office. Gibney then flew Jacoby from Montana to Albany, N.Y., so Jacoby could coordinate 17,000 rescue workers engaged in the state's response to 9/11. Jacoby confirms the day's events. "I was in Big Sky for an emergency managers meeting. Someone called to say an F-16 was landing in Bozeman. From there we flew to Albany." Jacoby is outraged by the claim that Gibney shot down Flight 93. "I summarily dismiss that because Lt. Col. Gibney was with me at that time. It disgusts me to see this because the public is being misled. More than anything else it disgusts me because it brings up fears. It brings up hopes--it brings up all sorts of feelings, not only to the victims' families but to all the individuals throughout the country, and the world for that matter. I get angry at the misinformation out there." 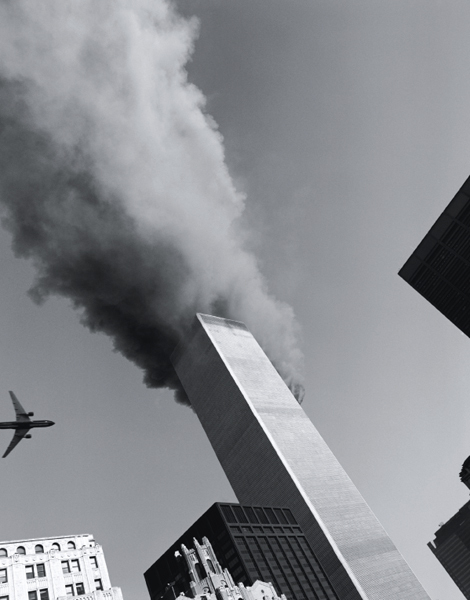 Popular Mechanics consulted more than 300 experts and organizations in its investigation into 9/11 conspiracy theories. The following were particularly helpful. Yates Gladwell pilot, VF Corp.
Dave Newell director, aviation and travel, VF Corp.
Thomas R. Edwards, Ph.D. founder, TREC; video forensics expert. Robert Clarke structural engineer, Controlled Demolitions Group Ltd.